Yeah, but: Buy a bigger one. The Long Version: Cable management is one of those little problems that causes a disproportionate amount of annoyance. Anyone with earphones will be familiar with the constant battle to untangle them and keep them that way; the Bobino "cable buddy" is one of the better options that I've tried. Made of flexible plastic, the spool is both utilitarian and durable. It has a notch on one side to nest the cable in, and then the remainder wraps between its two sets of horns. The spool is elegant, simple, and has a surprisingly small capacity. I use the smallest size, which isn't big enough to completely wrap my earphones around. Instead I'll double them up, locking the earbuds in place by wrapping the cable around it, and just letting the excess cable hang free. Since I rarely need the full length of the cable, some of it just stays wrapped around my little Bobino. That has the happy feature of keeping the excess cord out of my way even when I'm using it, which turns out to be surprisingly useful. 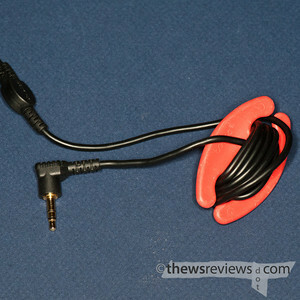 For all of this to work the cable needs to be wrapped and unwrapped each time it's used. That's actually just about as involved a process as untangling the earphones would be, so there's not much of a gain in total convenience. 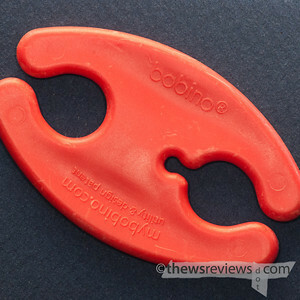 But for protecting the cable, and for not looking like a goof on the subway, the Bobino is a real win. There may not be an ideal solution for keeping cables untangled while still accessible, but the Bobino is the best one that I've tried. updated: I've now bought a bigger one. I have a small one, my earbuds wrap up completely inside the holes. I found that if I place the middle of the wire in the feed hole, I can wrap it from there to my device first and then from the bobino to my earbuds, since I most often need the length shortened during use, then I just make sure to unwrap the earbud end as far as it goes to access the length that goes to my device if I need longer length but it keeps me from having to completely unwind it each time I want to have a listen. Thanks for the review, it was quite accurate, my cord on my earbuds is slightly slimmer than what you have shown in the picture so I knew I would be safe with the smaller one and it's less to carry in my hand/pocket.